Hertz LA car rental of course, is the companies located in and around Los Angeles, California. The company offers several locations and a wide selection of vehicles for their customers. Hertz LA car rental offers many different services, which includes picking up and dropping off at the same location, a different location, one-way rental, and even hourly rentals. Hertz LA car rental offers many locations throughout the Los Angeles area. Some of the offices may not offer pick up and drop off at the location but have alternative points that are convenient for their customers. Hertz LA car rental divides their vehicles into categories like all other car rental agencies. Their groups or collections include Green Traveler Collection, Adrenaline Collection, Prestige Collection, Car/Sedan, Wagon/Estate, SUV/Minivan/4x4, Convertible, Commercial Van/Truck, and Other Reservable Models. Examples of the models you can expect from Hertz LA car rental in the various collections include Green – Toyota Prius Hybrid, Altima hybrid, and Camry hybrid. The Adrenaline Collection includes the Ford Mustang GT, Dodge Challenger RT, Chevy Camaro SS, and the Corvette convertible. The Prestige Collection offers Infiniti QX56, Mercedes GLK350, Volvo C70 convertible, Cadillac Escalade AWD, and the Lincoln Navigator 4WD, to name a few. 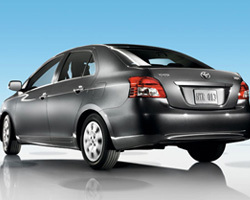 Car/Sedan group offers Chevy Aveo, Kia Rio, and the Toyota Corolla. In the Wagon/Estate group, you will find such makes and models from Hertz LA car rental as the Yukon Denali, while in the SUV/Minivan/4x4 collection you will be able to choose from a Grand Caravan, Ford Escape, Chevrolet Equinox, or a GMC Yukon, among others. The examples are for one-day rentals with the vehicle rented from the Hertz location at the Los Angeles International Airport. The Green Collection offers economy car for $70.49, compact for $72.49, and an intermediate for $77.49. The Adrenaline Collection offers a Dodge Challenger RT for $129.49, the Chevy Camaro for $134.49, and the Ford Mustang GT for $134.49. With Hertz LA car rental, you will find such deals as the Cadillac CTS for $124.49, Mercedes C Series for $131.49, and the Volvo C70 convertible for $136.49 in the Prestige Collection.